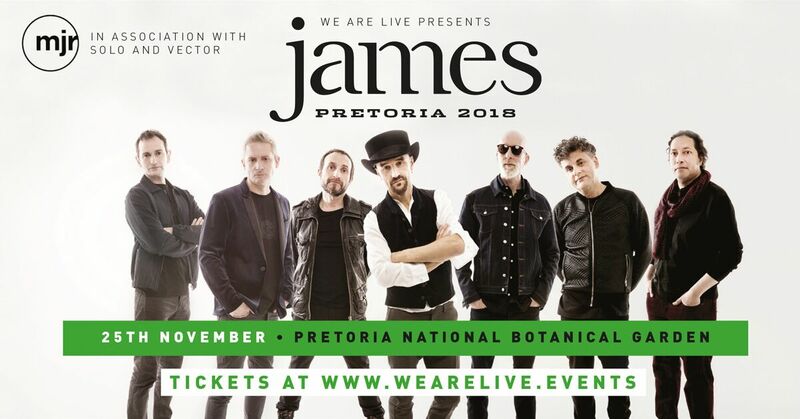 UK indie rockers James are proud to announce their return to South Africa after 18 years. This time, the enduring multi-platinum band will perform for the first time ever in in Pretoria at the National Botanical Garden. One of the most influential British indie bands, James was propelled from the musical tinderbox of early 80s Manchester and the 'Madchester' movement of the 90s into an enduring global career spanning over 30 years with hit after hit including Sit Down, She's A Star, Laid, and Getting Away With It. They have thrilled their global fan base with over 20 UK Top 40 singles and millions in album sales worldwide. 2016 saw the release of Girl at the End of the World, their most commercially and critically successful album for nearly twenty years, which came close to knocking Adele's 25 off the prized number 1 spot of the UK album chart.Their South African tour will follow the release of their 15th studio album, Living In Extraordinary Times, which is due to drop on 3 August 2018. Their energy, longevity and love of touring cements their status as one of the most iconic British bands to see perform live and a show which South African fans should not miss.